법주사는 신라 진흥왕 14년(553)에 인도에서 공부를 하고 돌아온 승려 의신이 처음 지은 절이다. 법주사 팔상전은 우리나라에 남아 있는 유일한 5층 목조탑으로 지금의 건물은 임진왜란 이후에 다시 짓고 1968년에 해체·수리한 것이다. 벽 면에 부처의 일생을 8장면으로 구분하여 그린 팔상도(八相圖)가 그려져 있어 팔상전이라 이름 붙였다. 1층과 2층은 앞·옆면 5칸, 3·4층은 앞·옆면 3칸, 5층은 앞·옆면 2칸씩으로 되어 있고, 4면에는 돌계단이 있는데 낮은 기단 위에 서 있어 크기에 비해 안정감을 준다. 지붕은 꼭대기 꼭지점을 중심으로 4개의 지붕면을 가진 사모지붕으로 만들었으며, 지붕 위쪽으로 탑 형식의 머리장식이 달려 있다. 건물의 양식 구조가 층에 따라 약간 다른데, 1층부터 4층까지는 지붕 처마를 받치기 위해 장식하여 짠 공포구조가 기둥 위에만 있는 주심포 양식이고, 5층은 기둥과 기둥 사이에도 공포를 설치한 다포 양식으로 꾸몄다. 건물 안쪽은 사리를 모시고 있는 공간과 불상과 팔상도를 모시고 있는 공간, 그리고 예배를 위한 공간으로 이루어져 있다. 법주사 팔상전은 지금까지 남아 있는 우리 나라의 탑 중에서 가장 높은 건축물이며 하나뿐인 목조탑이라는 점에서 중요한 의미를 갖는다. 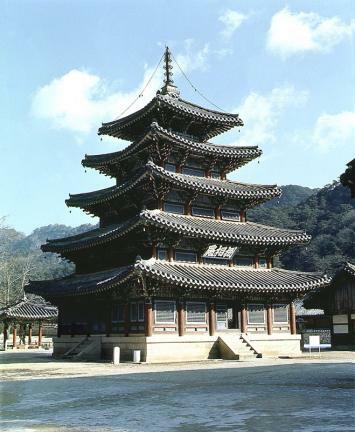 Palsangjeon Wooden Pagoda is the only wooden pagoda in Korea, which was built before the modern period and still stands in the precincts of Beopjusa Temple. 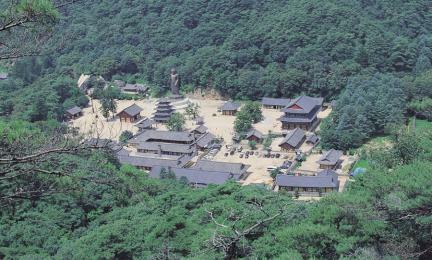 The temple was established in 553 by a Silla monk named Uisin who had studied Buddhism in India. 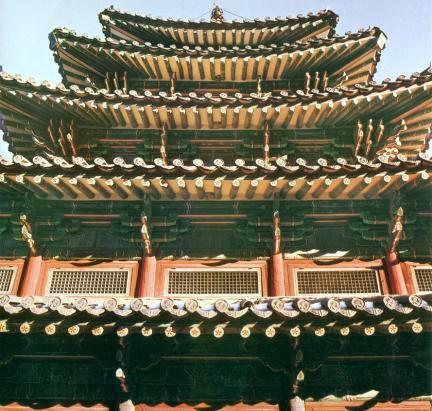 The current pagoda, a five-story structure, was erected after the Japanese Invasion of Korea in 1592 and rebuilt after being dismantled in 1968. 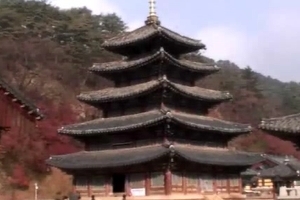 The name of the pagoda, which literally means “Hall of Eight Phases,” came from the hanging paintings depicting the eight important phases in the life of Shakyamuni Buddha. 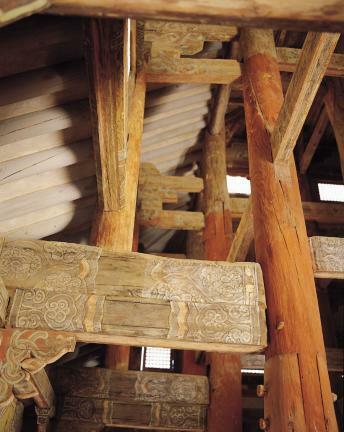 The first and second stories of the pagoda feature five kan (a unit of measurement referring to the distance between two columns) on all four sides, and the third and fourth stories, three kan; the fifth story has two kan. 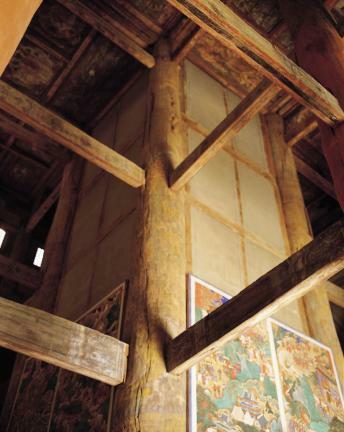 The wooden structure is set up on a stone base that is comfortably low, with four staircases one on each side. 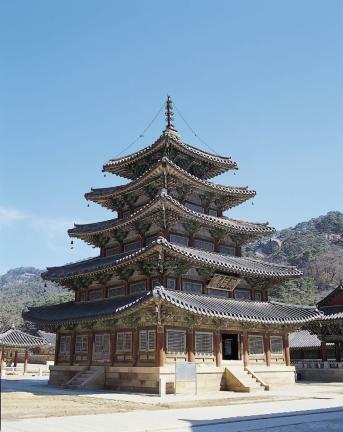 The pagoda is covered with a pyramidal roof with a finial on top. 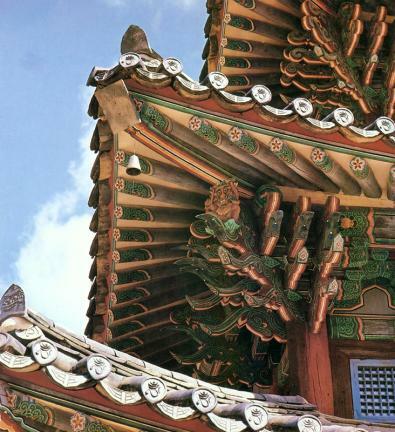 The pagoda is also characterized by the use of ornamental brackets placed on top of the columns in all stories except in the top story where the brackets are set not only on top but between the columns as well. 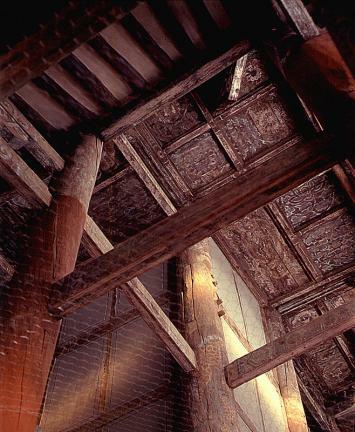 The interior of the pagoda is largely divided into three areas: the first area enshrines the relics of eminent monks; the second area houses Buddha statues and paintings depicting the eight major phases of Shakyamuni’s life; the third area is used for prayer meetings. 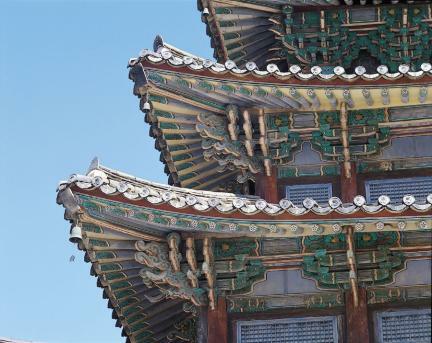 Palsangjeon Pagoda of Beopjusa Temple is the tallest among the pagodas in Korea and the only wooden pagoda remaining today, making it an invaluable part of Korean cultural and historical heritage.